When I traveled to Southeast Asia, I fell in love with the food. Traditional dishes, such as pad thai and chicken satay, were so quick and easy to prepare, and always bursting with flavor. 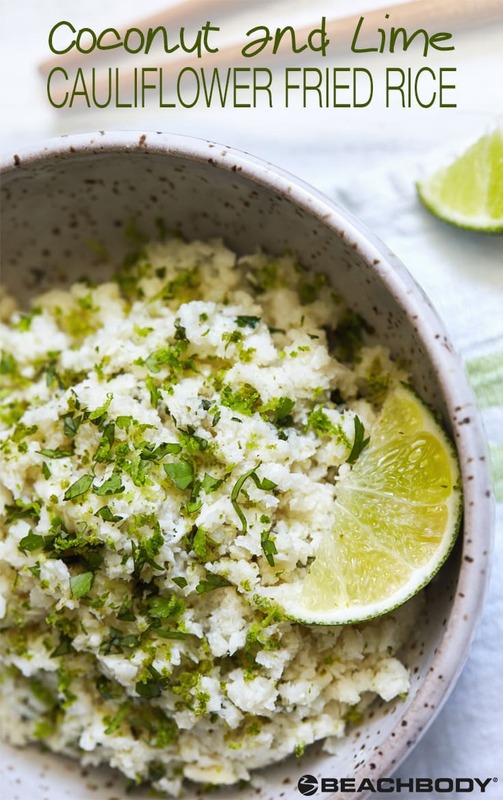 Very soon I began to understand how delicious coconut and lime could be used in savory dishes and with the ample variety of rice and noodle dishes, you might say it was hard to leave a carb unturned. Now, whenever I get nostalgic about my past travels through Asia, I like to experiment with similar flavors at home. 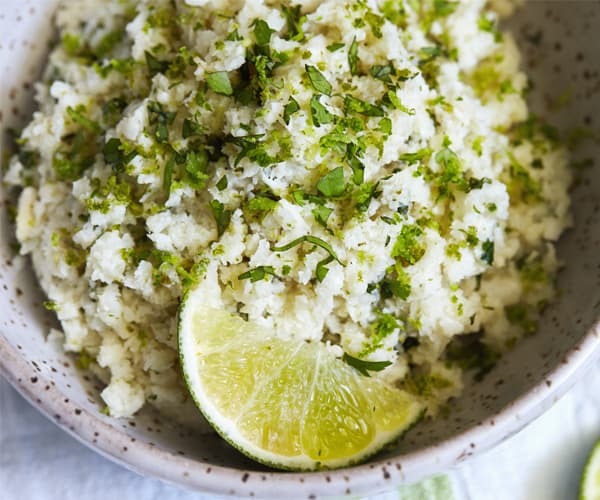 This Coconut and Lime Cauliflower Fried Rice balances fresh, bright flavors like lime juice and lime zest with coconut milk and shredded coconut. My absolute favorite thing about this dish is how it uses cauliflower instead of rice. If you haven’t done this before, I highly suggest you give it a try. 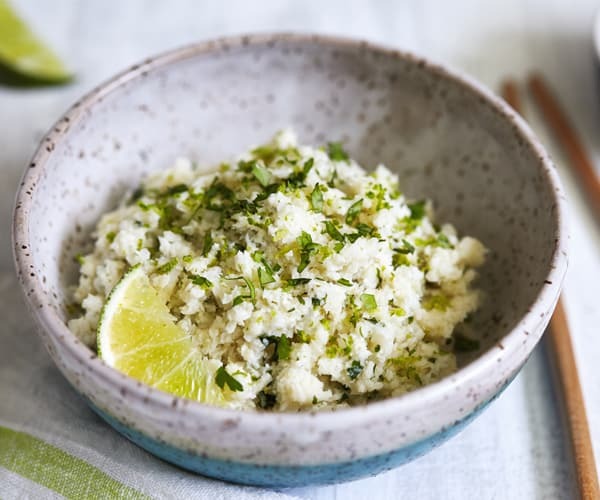 Cauliflower is lighter on the carbohydrates than rice, absorbs the flavor of almost anything you cook with it (in this case, creamy coconut milk, zesty lime juice, and fresh cilantro), and bumps up your vegetable intake. It might sound strange, but once you process the budget-friendly veggie into to small pieces, it really does look like rice! This “fried rice” recipe makes a large batch (8 servings) and extras store well in the fridge. So, if you’re not serving a crowd, wrap up any leftovers and enjoy them during the week. Serve the rice as a side with protein, or feel free to get creative and add other veggies or meat to make a stir-fry. Coconut and Lime Cauliflower "Fried Rice"
Place half of cauliflower in food processor; pulse until cauliflower is chopped into pieces about the size of rice. Repeat with the other half. Set aside. Add cauliflower; cook, stirring frequently, for 4 to 6 minutes. Add coconut milk, coconut, and 3 Tbsp. lime juice. Bring to a boil. Reduce heat to medium-low; gently boil, stirring occasionally, for 8 to 12 minutes, or until tender and liquid evaporates. Add remaining 1 Tbsp. lime juice, lime zest, cilantro, and salt; cook for 2 minutes, or until lime juice evaporates. Divide evenly into eight serving bowls; garnish evenly with cilantro. If you have questions about the portions, please click here to post a question in our forums so our experts can help. Please include a link to the recipe.